Southwest of Sri Lanka in the Indian Ocean, on the equator. 1,190 coral islands, forming an archipelago of 26 natural atolls. Stretches 820 kilometres north to south and 120 kilometres east to west. 202 are inhabited, 87 are exclusive resort islands. About 298,000 according to 2006 estimates. Origin of the Maldivians are lost in antiquity, but history reveals that the islands have been populated for over 5,000 years ago. Early settlers were travellers on the Silk Route and from the Indus Valley Civilisation. Inherently warm, friendly and hospitable by nature, it is easy to feel comfortable and relaxed with a Maldivian. 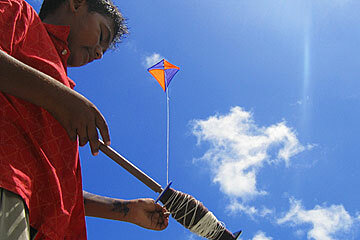 The Maldivian culture is rich with flavours from most of the seafarers who set foot on its soil. Traditional dances and music may not be an everyday event but there are occasions where traditional music and dances are performed. Though traditional dresses are not used by present day generation there are many types of traditional dresses made for both sexes. Like the unique geographical formation, the cultural events and ceremonials are unique according to the event that is celebrated or performed. Naming a newborn child, Bodumaloodhu (a prayer accompanied with festive meal), Eid festival and circumcision of male child are few events that take place where the taste of rich cultural 'cocktail' can be experienced. Bodu beru (big drum) performanceis the best-known form of performance of traditional music and dance where females and males participate. Bandiyaa (a dance performed by woman), Thaara (dance performed by male) is among the top traditional music and dances practiced in the Maldive Islands. Traditional food basically fish used as the main component has been influenced from the Indian subcontinent. Garudhya (tuna soup), spicy curry and rice are the stable food of most of the population. Most other dishes such as western meals like pasta are normally modified with a flavour of tuna in it when prepared for local consumption. Other meats and chicken are normally eaten in special occasions. 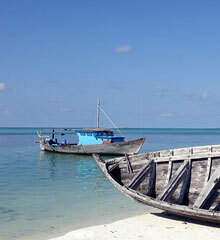 The Maldives economy has been growing at an annual average of 10% for the past two decades. Tourism is the main industry, contributing close to 30% of the GDP. Fisheries and trade follow close behind. The Maldivian economy is regarded as exemplary in the region and welcomes foreign investment. The Maldivian currency is the Rufiyaa and Laaree. The exchange rate for US Dollar at currently (2006) is MRf.12.75 for the dollar. One Rufiyaa is equivalent to 100 laarees. Rufiyaa bank notes come in denominations of 5, 10, 20, 50, 100 and 500. Coins are in the denominations of MRf.2.00, MRf.1.00, 50 laarees, 20, 10, 5, 2 and 1 laaree. The US Dollar is the most commonly used foreign currency. Payments in the resorts and hotels can be made in most hard currency in cash, travellers’ cheques or credit cards. Commonly used credit cards are American Express, Visa, Master Card, Diners Club, JCB and Euro Card.